LED Lighting (Commercial LED Bulbs and fixtures) for your facility (parking garage, hotel, office, factory, warehouse, showroom, institution and more). LED bulbs: Commercial Facility Lighting Money Saving Program - It's time to retrofit to LED! relative to a facility equipped with fluorescent bulbs. 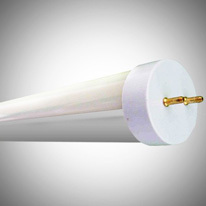 FYI Our cg8 series of T8 4 foot LED tubes use 18 watts per bulb. 34 watt fluorescent - 18 watt LED = 16 watt consumption reduction. 16 / 34 = 47% savings per bulb. 40 watt fluorescent - 18 watt LED = 22 watt consumption reduction. 22 / 40 = 55% savings per bulb. To simplify, let's use 50% for the savings amount. *** Electricity for lighting typically is 25% - 30% of the total energy consumed by most businesses. So, relative to fluorescent, the savings are great. 50% savings per bulb x 25% of your electricity = 12.5% savings by switching to LEDs. Your savings on every $10,000 of electricity you are now consuming could be $3,250. Your savings on every $100,000 of electricity you are now consuming could be $32,500. Air conditioning savings not included LEDs save 50% versus fluorescent bulbs. If you have halogen, incandescent, halide, and other types of bulbs, the savings are far greater! ****Save More by using motion sensors on your LEDs, or simply turning banks of LED lights on only when you need them (you can't do that with slow-to-light halides, and fluorescent have their lives reduced by turning on frequently). Again, LEDs are the clear winner! Making it happen for you . . .
Would you like to receive a proposal that shows you the money?